We told you there were a lot of great new magazines out there. Modern Farmer gives us a -- well -- modern look at today's farmer. We are not talking about Ma and Pa Kettle and the kids on the lower forty. We are talking about space, the final frontier. Farms dotting the globe. Articles by former President Bill Clinton. This publication is no issuu project. The founder and editor in chief, Ann Marie Gardner,has worked for The New York Times and Tatler magazine. Like many people, she noticed and uptick in interest in farming and conceived of a magazine that might address farming in the 21st century. To make her vision a reality, she proposed the idea to gazillionaire investors and Frank Giustra said give it a try. Giustra, who was once the chairman of Lion’s Gate Entertainment was becoming interested in farming himself, after venturing into olive oil production in Umbria. While no one is talking money, it was clearly enough to produce a glossy magazine with a nice sized staff. While their focus is farming, you won't find articles about planting an herb garden, unless you are planting it on the moon. You will find artisan cowbells, an illustrated 1941 farm journal, a chef who eats dirt, and the hows and whys of illegal milk crates. Recently, they offered up three of London's hottest farm-to-table restaurants, featuring The Grain Store whose chef, Bruno Loubet, is our Cookbook Of The Day. 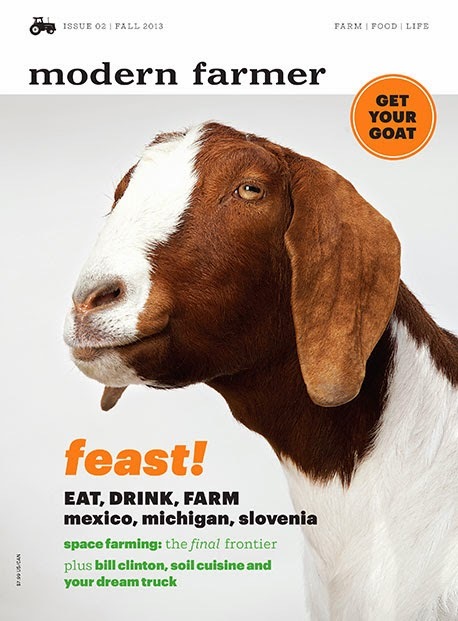 Modern Farmer offers up a modern digital edition, complete with a web site; as well as a traditional print issue.